Captain Silver (キャプテンシルバー, Kyaputen Shirubā?) is a side-scrolling action game released for the arcades by Data East in 1987. In the game, the player controls a young sailor named Jim Aykroyd who goes on a journey to seek the lost treasure of Captain Silver, facing various perils along the way. Home versions were released for the Sega Master System by Sega and for the NES by Tokuma Shoten. The controls consists of an eight-way joystick for walking, crouching and climbing ladders and two action buttons for attacking and jumping. The player is armed primarily with a sword slashing horizontally while standing and crouching and vertically while climbing a ladder. The player can also move while crouching. Picking up flying fairies grants the player magic power, shooting projectiles with the sword. The player can increase the magic power by up to six levels, resulting in greater and more powerful projectiles. There are other power-ups such as a longsword to destroy enemy projectiles, a pair of boots to walk faster and jump higher, a bottle of potion to take a hit from an enemy, and a stopwatch that temporarily stops the time limit. Both the longsword and the boots can only be used temporarily at first, but if the player acquires a second version of either while still wearing the previous one, they can be kept permanently until the player loses a life. Treasure items can be acquired for points as well. Keys can be acquired which gives the player access to item shops and treasure vaults. The player's own score is used as currency to gain power-ups and extra lives at the expense of a lower score. Defeated enemies will drop letter icons that the player can collect for points as well. 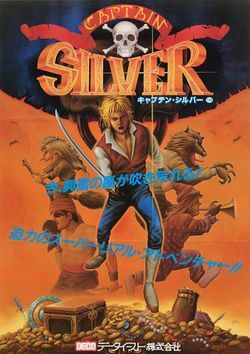 If the player collects the required letters needed to fill out the "CAPTAIN SILVER" gauge at the bottom of the screen, an extra life is obtained. There are a total of three stages (or scenes): a haunted town at night, a pirate ship, and a treasure island. Each scene features its unique set of enemy characters such as werewolves, witches, pirates, natives, several kinds of animals, man-eating plants and other hazards. Scene 3 ends with a final battle against the skeletal being of Captain Silver. After the player complete the game once, there is a second quest consisting of harder versions of the same stages in order to finish the game. The Sega Master System version was released by Sega on July 17, 1988. Two versions of the game were produced, a 1-Megabit cartridge for the American market and a 2-Megabit cartridge for Japan and Europe. The play mechanics in the Master System version is roughly identical to the arcade game and most of the power-ups and bonus items are retained, the player can only increase magic power by up to three levels instead of six, the longsword power-up is removed, boots cannot be worm permanently. However, the medicine power-up can last permanently until the player gets hit and there are also treasure chests in certain stages that will give the player one of two rewards (a bonus item or free access to an item shop). Unlike the arcade version, the Master System can be completed. The American version only features four stages roughly based on the ones in the arcade version (a town, a ship, an island, and a mountain) and only two bosses (Captain Coppard and Captain Silver). The Japanese and European version features two additional stages set intermittently between the before the final two stages, several additional enemy characters, a boss for each stage in addition to the ones in the American version (a sorceress, a cyclops, a fire-breathing dragon, and a banana-shaped warrior). The ending epilogue in the Japanese and European version also features visuals as well instead of the text-only epilogue of the American version. Both versions supported Sega's FM sound module for the Master System. The Famicom version was released exclusively in Japan by Tokuma Shoten on December 16, 1988. This version features several substantial differences from the arcade version. The player now has a health gauge and can take more than one hit before losing a life (which can be replenished by picking up hearts). However, some of the enemy grunts now take more than one slice to defeat as well. The player can now purchase all weapon power-ups in item shops, which can be changed through a sub-menu. The stages are different and the bosses include new foes such as Frankenstein's monster and a giant octopus. The player can enter houses and rooms where an old lady will offer advice to the player (such as an enemy's weak point). However, some of the old ladies the player will encounter are hostile and will bring a curse to the player (like reducing his health by half). The ending varies depending on whether the player used a continue to finish the game. This page was last edited on 20 August 2015, at 02:36.